And now onto the fruity part of today’s post. This time of year it’s hard to convince yourself that those brown twiggy things sitting up to their necks in claggy clay, looking all but dead and lifeless will in a few months’ time be covered with bright green leaves and adorned with ripening berries. That’s what I have to remind myself as I squelch my way up to my allotment. It’s still cold, often rainy and definitely windy but the days are getting lighter and longer my friends, oh yes! The more I’ve gardened on my allotment and the more I’ve lost to drought, deluge, pest and pestilence the more I have come to appreciate growing fruit. It is relatively simple, easy and yes fruitful….. (sorry?!*). And after an initial outlay you get a great return for your money and little effort; growing fruit really is the busy (and in this case lazy) woman’s allotment banker. The crop that will crop. And keep on cropping for years to come. And for those who are allotmentless I used to grow currant bushes in large pots in the garden – so you don’t need acres of land to savour home-grown fruit. Pick the berries and scoff them all at once. Alternatively wash and drain them and freeze in Tupperware boxes. And dealing with gluts couldn’t be simpler – eat, share, jam or freeze it. So come mid winter and you’re searching the depths of your freezer a tub of shiny red currants winks at you and before you can say “Sacrebleu Groseille!” you have an idea and you’re rolling up your sleeves, dusting the rolling-pin off and denying all knowledge of almonds. If I had to choose just one of the currants to grow it would be the red ones – I like their sharp sweet tangyness. Perfect partners for a sweet tart and today’s recipe. The original idea for the recipe came from a book a friend was throwing out “A little taste of France”. The sweet pastry is a standard recipe, as is the frangipane. All I did was to half the quantities to fit my new shiny oblong tart tin. Classic French Red Currant Tartlets or 1 big pie! Cover the ball of dough with clingfilm or a plastic bag and place in the fridge for at least an hour. Beat the butter until very soft, add the icing sugar, ground almonds and flour and mix well. Take the dough out of its wrapping, dust a worktop or board lightly with flour and gently roll the pastry out to a thickness of 2mm (1/8”). Place the tin on a baking tray and bake for 10 to 12 minutes, or until golden. 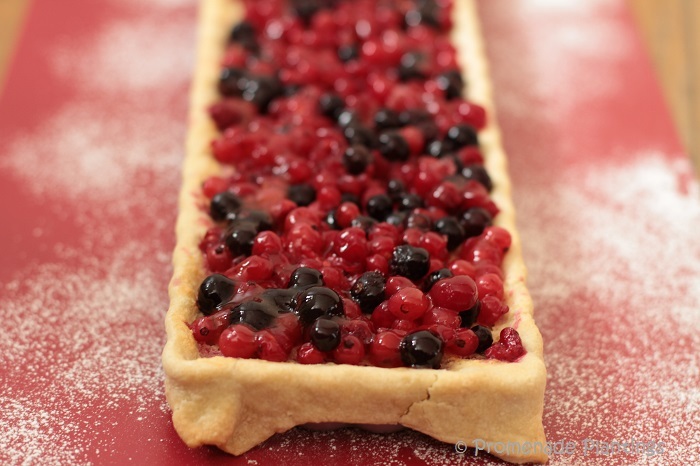 Arrange your currants, berries or fruit (your choice) on top of the tart. Gently melt 2 tablespoons of apricot jam with 1 tablespoon of water in a pan, sieve out any lumps and brush over the berries to make them shine. Thank you. It was great to have a taste of summer during mid winter grey skies! This looks wonderful! It reminds me, too, that I have raspberries and strawberries in the freezer, perfect right now when I am so craving the bright summer flavors! Thank you, Claire! A perfect combination currants and almonds. 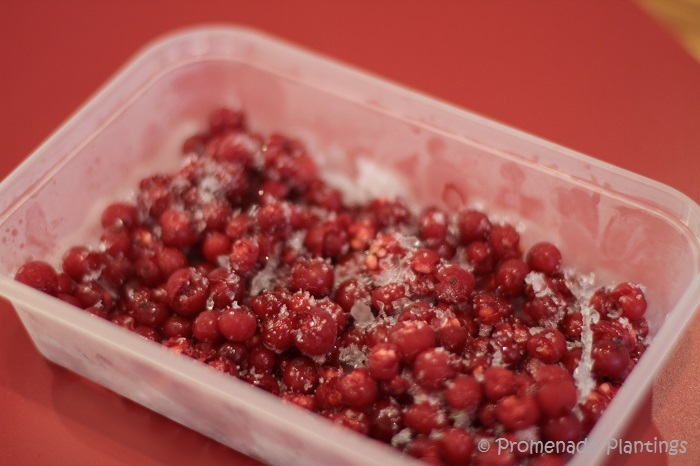 We’ve just emptied the freezer of the last of the red currants add hey presto 16 jars of red currant jelly. They’re easy to grow and when you want new bushes just take some hard wood cuttings and stick them in the ground. P.S. Nice to see you back in the blogging circle. Perfect post to read on this rainy day! Lovely. We’ve been lucky and had a few sunny days here, it’s a joy! 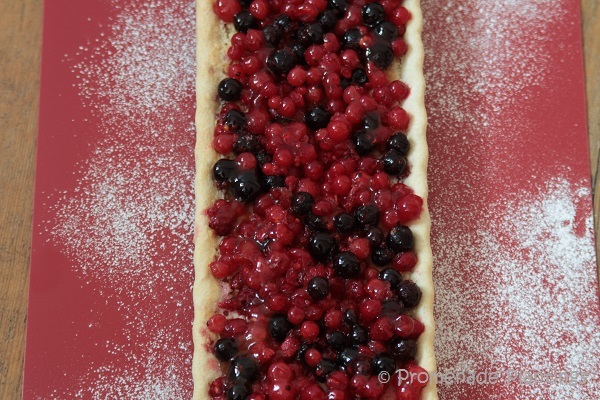 I love red currants but I’ve never made a tart as lovely as this one. Aw shucks Maureen, I bet you have! I’m pleased to admit that everyone enjoys almonds at our house, thank goodness. The Red Currant Tart is a stunner! I can’t imagine that there were any leftovers…. As I live in the Southern USA it just simply gets too damn hot in the Spring and Summer to grow currants! I am always so envious of my friends who live in Maine and spend their summers there and bring back lots of currant jam…so envious…so they share. I think your dessert is just fantastic and beautiful and I would love a bite right now. Lovely post and very informative! I’m learning through blogging and this post that currants and berries are a cooler climate fruit, but then I guess you have your treats too that I in turn am envious of! Sacrebleu – it’s aubergines and courgettes that get that reaction in our house (again, not from me!). Gorgeous tart (not you missy!) and the house we bought at the end of last year appears to have a gooseberry bush so maybe we could plant a few other berries and see how they do. You can bake and cook for me any time! And I’ll never complain about anything almond. I’ve also just started fruit growing here in zone 10 — citrus for the moment. Evening Kevin, it woul dbe a pleasure! Now growing citrus really apeals to me – I’ve always wanted a lime tree so I coul dhave a slice in my G&T…. you can see where my priorities lie?! I’m sure almonds are great for you, they are liked whole but aparently it’s when they are in things… no I don’t understand that either! I love all things almondy! And I’ve just acquired my first currant canes, so hope they take. I agree that fruit is just the best thing to cultivate – such good returns as long as the birds don’t get there first. hi Helen, I hope you get a great crop from your new canes, I think they take a little while to settle in so that by the 2nd year you get super crops, and as you say – net, net, net! My friend’s husband doesn’t eat any nuts or onions that he can see. Anything obliterated in cooking or baking is fair game. He inhaled 5 Macarons in one sitting. Currants are such a European delight, I hardly ever see them at our big grocery stores. This dessert looks like a beautiful combination of tangy and sweet. Inhaling Macarons sounds about right – they are leathally delicious! I don’t think I’d really realised how much currants are a northern/cooler climate crop. But I bet the tart works with all kinds of fruit – from kiwi fruit to appricots….. Almost too pretty to eat. Almost! I’d have gobbled up my fair share, what a delightful looking sweet treat. I’m all about almonds, so I’d really suffer living with others who couldn’t bear them, but my children are happy to make up for that with many other foodstuffs. The list of things my children will complain about is too long to share here, however 🙂 This post has convinced me to add more currants in our garden plans (we ‘currently’ have just one red currant bush). I’m probably not going to grow fruit, but I love discovering berries growing wild and helping myself to their bounty. ah wild berries are wonderful and simply the best! Hi Barbara, lovely to see you here on the promenade. I hop eyou managed to deal with the dessert craving! and guess what we’ve had some sunny and warm days here, woo hoo!! Looks wonderful–I’ll be making this the next time I can find currants! I am another one in the anti-almond camp. My grandparents were Danish and there were many traditional treats that I wouldn’t go anywhere near. But if this were made just with regular ground almonds (vs almond paste), I think I would try that. A beautiful tart either way. I am also resolved to grow more fruit. After our pear trees started producing and our raspberry patch took off, it was sooo exciting (except when something ate my pears almost overnight last year). Now I’m anxious for spring!